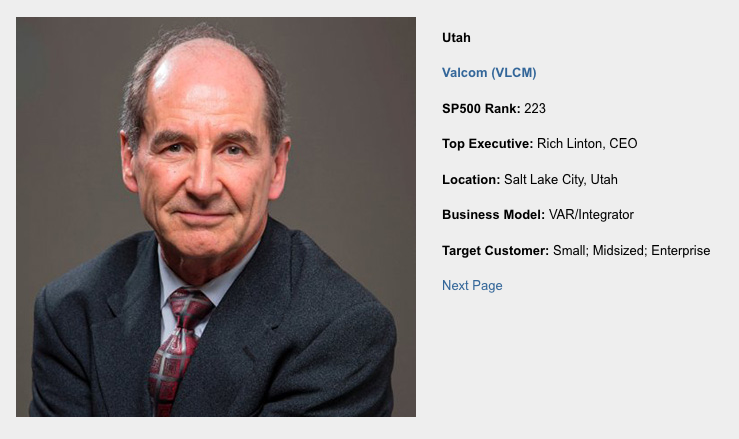 Salt Lake City, UT, June 6, 2016 – VLCM announced today that CRN®, a brand of The Channel Company, has named VLCM to its 2016 Solution Provider 500 list at number 223, in addition to Utah's Biggest Solution Provider. The SP500 list is CRN’s annual ranking of the largest technology integrators, solution providers and IT consultants in North America by revenue. The SP500 is CRN’s predominant channel partner award list, serving as the industry standard for recognition of the most successful solution provider companies in the channel since 1995. CRN has also released its 2016 SP500 Newcomers list, recognizing 47 companies making their debut in the SP500 ranking this year. VLCM is placed at #223 on the list, moving up five spots from the previous year. A sampling from the 2016 Solution Provider 500 list will be featured in the June issue of CRN Magazine and at www.CRN.com/sp500. VLCM is a leading IT provider for the Rocky Mountain Region, with offices in Salt Lake City, Lehi, St. George, Boise, Denver, and Albuquerque. VLCM provides customized IT solutions and warranty/non-warranty repairs, servicing both public and private sectors. Our 3-decades of expertise has landed VLCM in the CRN MSP 500 and Tech Elite 250 lists. Get IT news and blog updates delivered to your inbox.